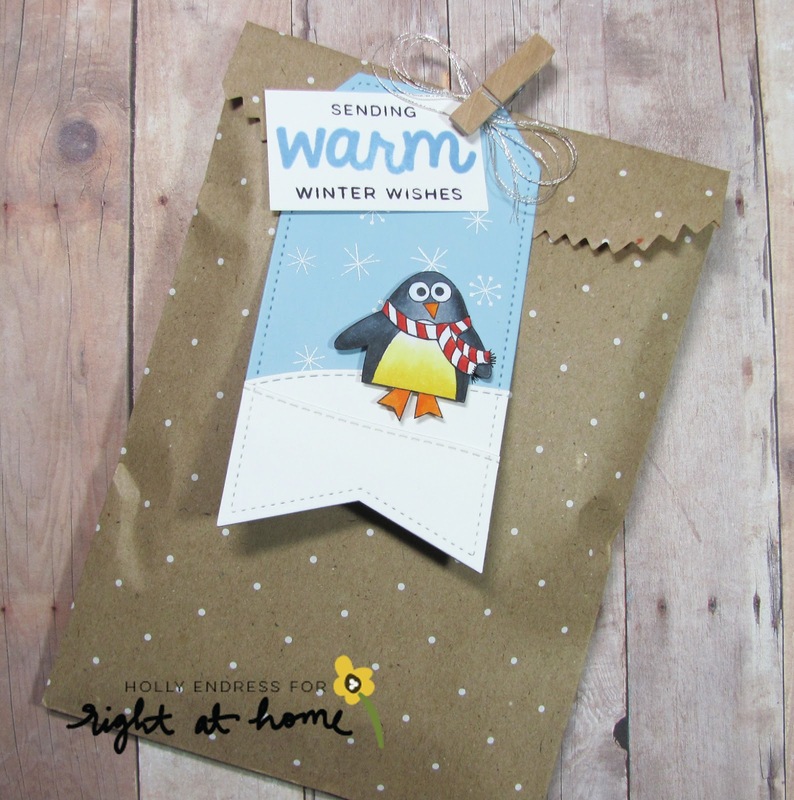 I've got two more projects today showcasing the new Release from Right at Home. You can see the cards I made yesterday in this post here. I created a Kraft card base for my first card and stamped the background with a Distress looking stamp (no idea what this is called, it's a retired one from my stash) using some Kraft colored ink from SSS. Then I added a few strips of pattern papers form the Doodlebug Sugarplum 6x6 pad. I stamped the sentiment from Holiday Sentiments in Lawn Fawn Walnut ink over the patter paper strips. I stamped the leaves outline image from Poinsettia set in some Noble Fir ink from Lawn Fawn onto some Green cardstock and trimmed them out. I punched out some circles of Red card stock for the berries and added the Hash marks from the Christmas Critters set in some Walnut ink as well. I added the Holly over the papers with dimensional adhesive. 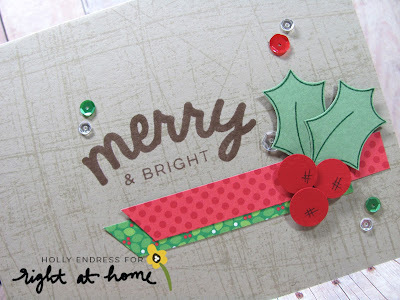 I had these Christmas sequins in my collection and they were perfect to pair with the colors on this card. For my second project I created a cute Gift Tag using the Holiday Sentiment set and the Christmas Critters set. I die cut the tag shape and snow using some dies from Mama Elephant. I stamped the snowflakes form the Christmas Critters set and heat embossed them in White. I stamped the penguin image from the same set onto some White card stock and colored him in with Copics and cut him out. 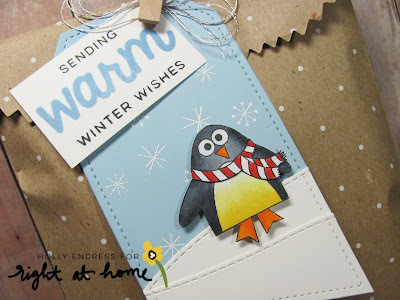 I stamped the sentiment from the Holiday Sentiment set using some Blue and Black inks and then I added it to the top of the tag with a mini clothespin. I attached the tag to the paper bag with the clothespin and some Silver Thread for a bit of Sparkle. I don't know about you but I think this penguin is the cutest.. He's unique and I love the eyes. Head over to the Right at Home Shop and pick up some of these fun sets.. and stop by the Blog for more great inspiration using these sets.